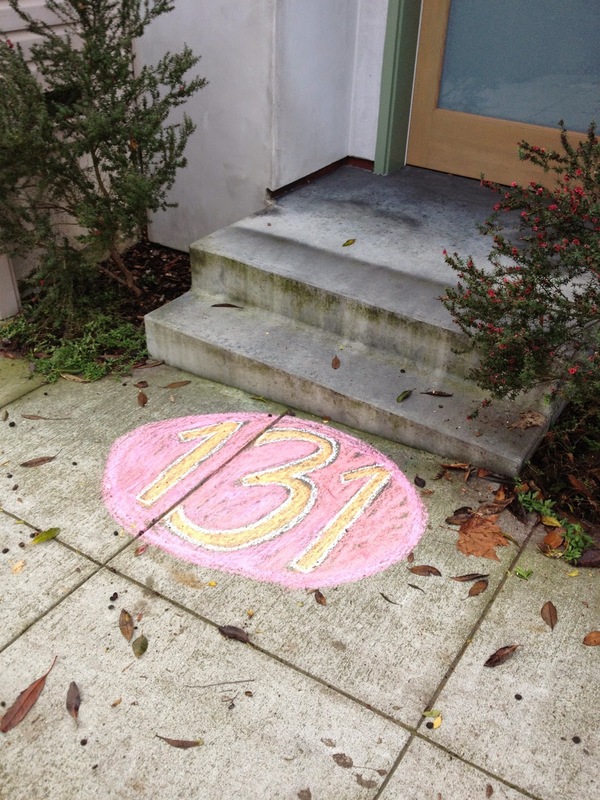 Remember way back when, when I didn't have any door numbers and was doing chalk house number mock-ups on my sidewalk for an eventual design in paint? Well I finally got around to that. 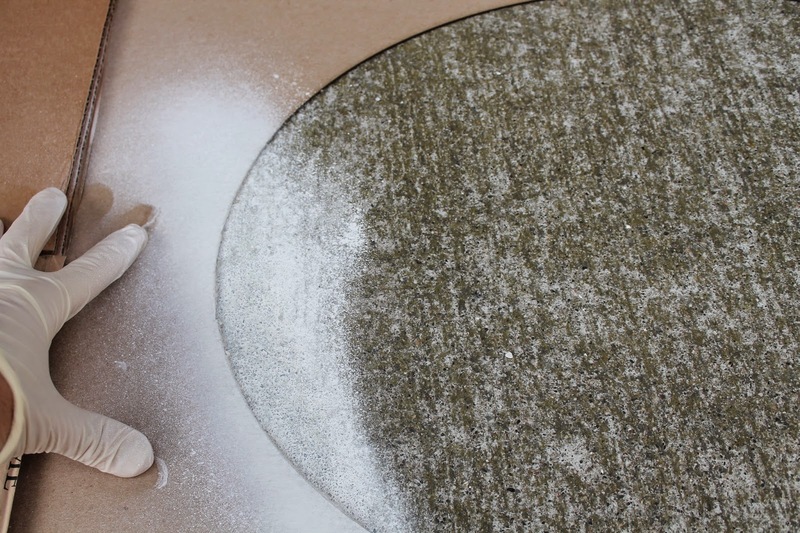 I did love the organic nature of the chalk and they were fun to make but keeping up with them was a hassle and then we'd have no number identifying the house. This was a multi-step process that was made possible and exponentially easier by a laser-cut stencil that my sister helped me make. We designed the graphic in Adobe Illustrator and then she plugged it into her laser cutter at work -that's why this thing is so friggin pro-fesh-on-al...She did all the work! This is what a laser cutter actually looks like in action. My sister took this video when Ethan was visit NYC last summer (I told you I've been sitting on this project for a long time!!) Talk about aunty extraodinaire, btw. Choosing a good color combo was excruciating. It took several samples to get it right. The trick was to find something that popped but didn't clash with the house trim. For paint, I used Montana Black instead of a hardware store brand for a couple of reasons. 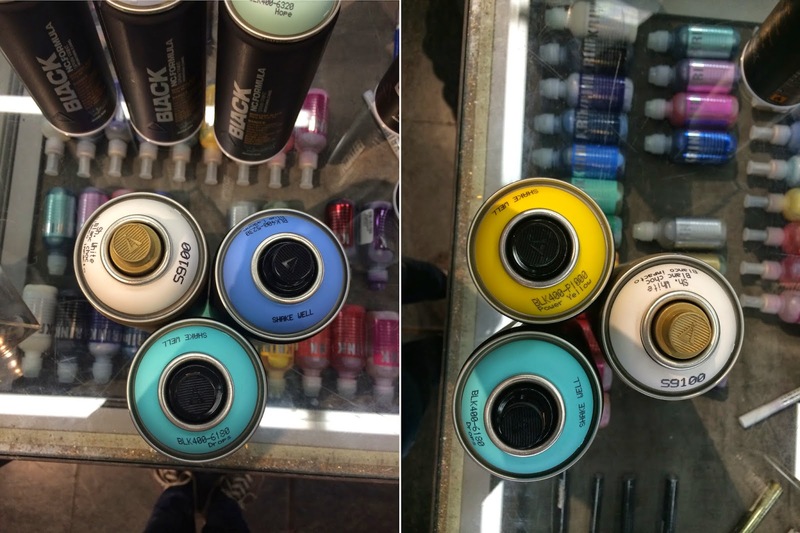 First, there are obviously many, many more colors to choose from and secondly, it comes in a very low luster sheen (it's flat but not chalky looking like a hardware store brand flat spray paint). 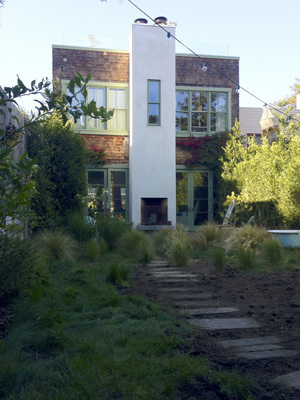 I wanted this project to look really good and cohesive with the house -I mean, I'm spray painting the sidewalk in front of my house... that could go really wrong in a hurry. A glossy paint, in the wrong colors could look very kindergarten in a bad, bad sort of way. Montana cans cost about 9$ a can at my local art store, btw. So, about 2 times as much as Rustoleum, for example, but well worth it. 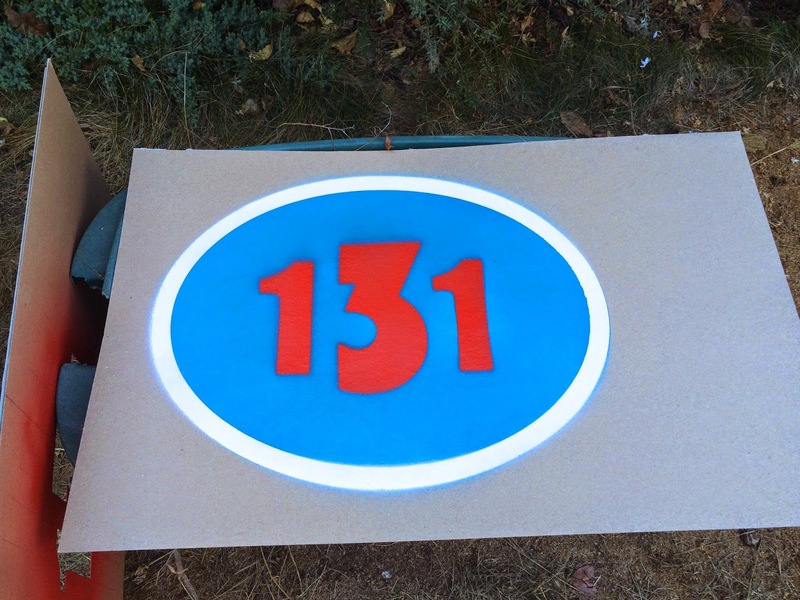 Once I chose my color combo, I had to figure out how to get this 3-part stencil to logistically work. I found and marked (from edge to edge) the center lines of each stencil and made a corresponding mark on the sidewalk. 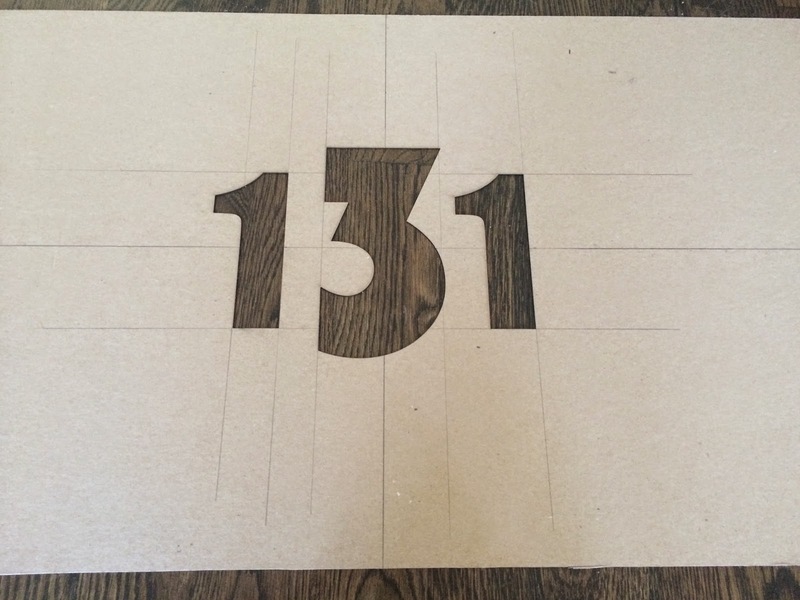 This was the easiest way to take any guesswork out of laying the stencils, especially because the one with the numbers was a complete blind lay down. In a spot that I knew would be covered with the final design, I tested to see how clean the edge would be on the fairly rough sidewalk. I did this with BIN 1-2-3 primer, because I thought it would be prudent to do a base coat anyway. The edges were fine. 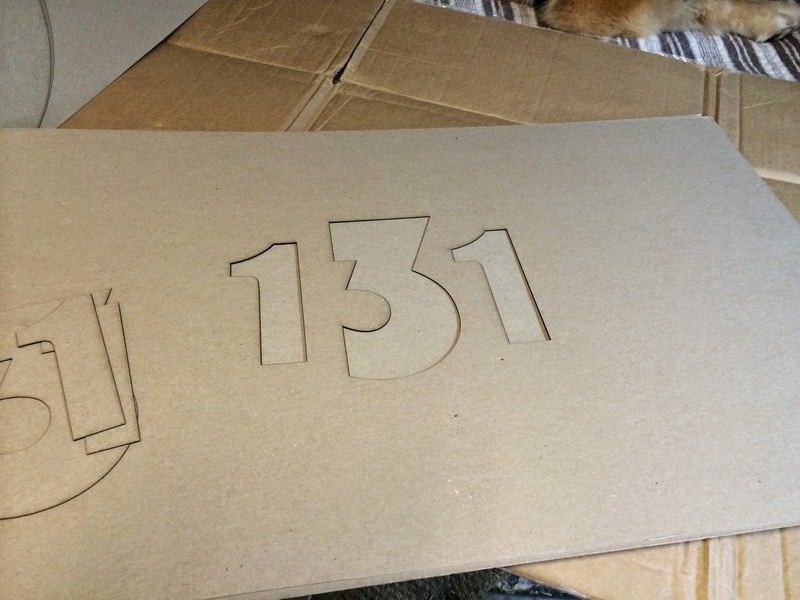 Had this not been the case, I was going to use a concrete patch kit to create a smooth area for the stencil and am SO glad I didn't need to do that. 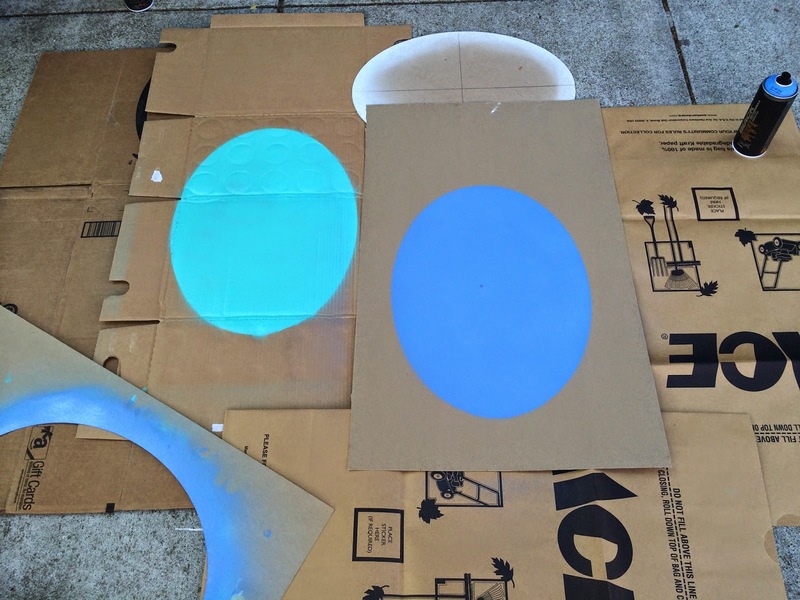 This is the first stencil that creates the blue background. I did a lot of covering up because it is still summer in San Francisco, which means lots of wind. After the blue coat, a white boarder was added by placing a smaller ellipse inside this one. (sorry no pic). 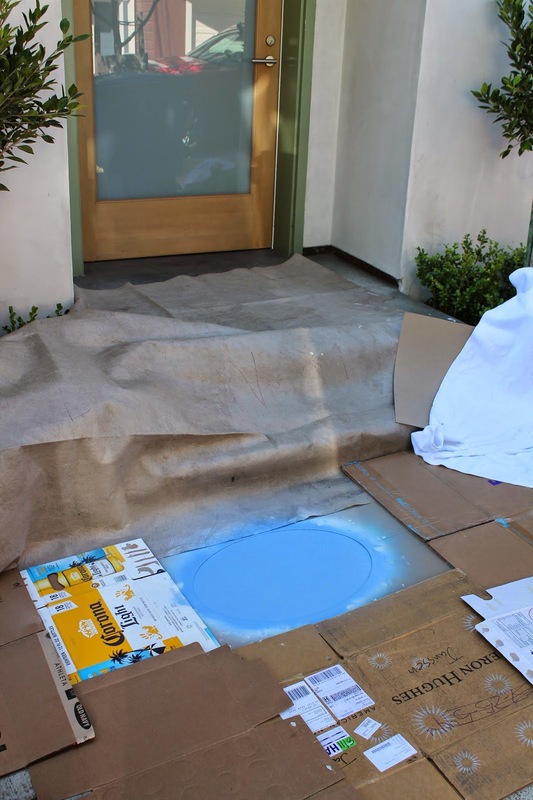 I did 3 coats of blue, over 2 days, to make sure I covered all the divots in the sidewalk. The numbers. I used coke bottles to try to hold the stencil down in as many places as possible. In this picture I have the largest ellipse on top to make sure my alignment was correct. What do you think? Do tell. OK !!! that my friend is so awesome! Wow, I LOVE IT! It looks so crisp and clean, almost like it's photoshoped in - it's just so perfect! Do you think it'll stay looking as good? Thanks Laetita! Now get back to packing!!!! I love it! So unique! And those colors pop! 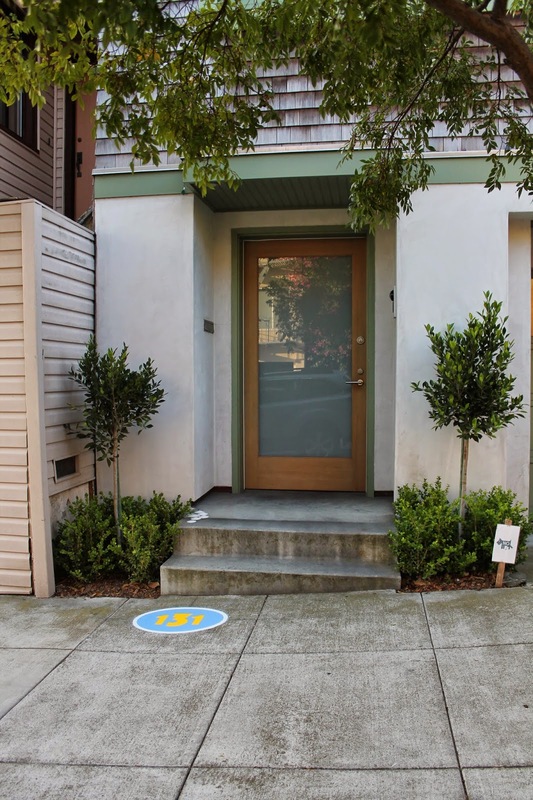 These are the coolest house numbers! Love your toilet plungers too and especially, your backyard shed that I read about in the Chronicle this morning (that's what sent me to your blog). We have one too. It houses my sewing machine and lots of craft supplies and a good many bugs. But I dream of doing it up like a cabin, so I loved seeing yours - nice work! thanks Jessica :) See you at the ORC! Thanks Colleen. YOU have a cool blog. So glad to have found you.